My name is Constantine. I took it upon myself to record the reality and events of this turbulent time, as truthfully as humanly possible. Our beautiful world consists of vast seas, here and there littered with archipelagos and islands. The largest cluster of islands has approximately 2 million square kilometers of landmass. Other than that, there are a few other smaller archipelagos or isolated islands around the world. The main cluster is mostly dominated by rocky terrain and mountainous ranges, with limited arable land, but rich deposits of minerals and ores. Because of this set-up, most commerce flows by the sea and air, on the magnificent steamships and airships. The society, at least the middle to upper classes living on or near Capital Island, the largest piece of land, has been thriving since the invention of the steam engine. Which brought about an industrial revolution, changing the world. In the last few decades, the world has witnessed more technological advancement than ever before in its history. Coal is the main resource fuelling the industry — power stations, land, sea, and air transportation, manufacture, and the military. But, in the more advanced facilities, special laboratories, and top military installations, first combustion engines omen a new coming age. Capital Island is experiencing a record growth in commerce, population, and a boom of construction industry. New buildings are popping up every year in an architectural combination of clean ornamental geometry and functional industrial evolution. The culture in these times reflects the technological advancements and admiration for the modern machine. Apart from the insignificant isolated island states, every piece of land, everything, and everyone is controlled by one central government body — the Supreme Bureau. The institution governs every inch of people’s lives — from education, production, to consumption of resources — and also directs scientific research and cultural development. Nothing functions without the approval of this bureaucratic apparatus. Things were not always such. The world used to be divided in many island states and local domains. But the Supreme Bureau, with its ever-present motto and disciplined military might, arose as the dominant force and subdued the world under its watchful eye. Shortly after suppressing the last widespread rebellion against the authoritative regime, top seismologists on Capital Island detected a huge earthquake 450 miles south of the Bureau’s residence, on the high seas of the Meridian Ocean. The main cluster suffered one of the worst tsunami hits ever recorded. In the aftermath of this nearly cataclysmic event, the military brass of the Bureau thought the rebels were still operational, abusing unknown unconventional weaponry. However, investigation of the epicenter of the quake ruled out rebels’ involvement. It was in one of the most dangerous and unpredictable waters of the whole world — Mare Vaporum. The Sea of Fumes. No one really knows when or how it was formed. Mare Vaporum got its name from the vast amount of fumes that exudes from the water. The source of this specific behavior was unknown. The sea in these parts is unnaturally gassy and has higher temperature than the surrounding areas. The fumes obstruct navigation and make the water highly corrosive. Due to low visibility and aggressive corrosion, both steamships and airships have long avoided this part of the world. Notorious sailors’ superstition also played a rather vital role in this, as many ships were lost without a trace in Mare Vaporum before. Now, the Supreme Bureau decided to delve right into the mystery, sending diver teams equipped with bathyscaphes down there, into the deep. They sent out several teams to explore the underwater area. Some of the bathyscaphes never reached the seabed. Often the crew of these underwater machines had issues with failing machinery or hull-breaching. Some of them delved deeper, but disappeared without a trace, probably simply getting lost due to bad visibility caused by the fumes. No wreckage or debris of the bathyscaphes were found. As if there was something that didn’t want to be found. Something they must have found very valuable, as they did not hesitate to sacrifice human lives in retrieving the thing. Soon after, they launched new scientific projects and built research facilities on the nearest hospitable piece of land, the Katkennut Island. Grandiose projects in scale. Some of the experiments carried out didn’t end well. In fact, there are rumors speaking about catastrophic fire on the island. But the specifics were vague, newspapers only mentioning some kind of a natural disaster. Then, a few years ago, there was another rumor among the intellectual elite of the Isles. The Supreme Bureau was building something big right in the midst of Mare Vaporum. 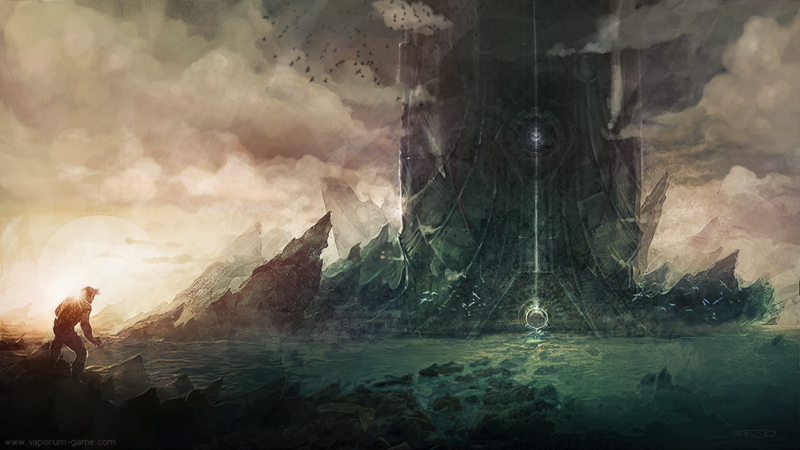 A citadel, maybe a tower, codenamed the Arx Vaporum, dedicated to a specific scientific goal. They started to select people for the project. The selection process was very rigorous, employing elite engineers, scientists, workers, military, and other personnel. It is said they hired not only individuals, but whole families to help them build a new better world. But what is this Arx Vaporum, and what secrets does it hold? We are not sure about this. What is known, but not generally acknowledged by the Bureau, is that they found something on the seabed that can change our future. The technological marvels of our time are only the beginning. But perhaps, there is something more sinister in all of this.